If you put a drop of adhesive with thickness H0 and radius R0 between two surfaces and squeeze with a force F, then depending on the viscosity μ the drop will expand and the thickness will decrease. The app shows the rapid squeezing at the start, slowing down dramatically as the gap gets smaller. If you have a reactive adhesive then the option exists to incorporate the increase of viscosity within the app. 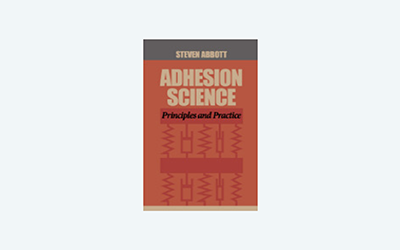 If you place a drop of adhesive between two surfaces and squeeze, what forces and times are required for the drop to spread to the required radius, and what happens to the thickness of the adhesive during the spreading? You start with an idealised cylinder of thickness H0 and radius R0 and then squeeze it for a total time tmax. Because you are likely to know the volume of the adhesive drop with some idea of the initial radius but no idea of its idealised height, the volume of the initial cylinder is calculated. You can then alter H0 until the calculated idealised volume is similar to that of your real drop. The graphs tell you what you want to know, with the thickness graph plotted on a Log scale because a linear graph shows a rapid drop and an uninformative long plateau. The final radius, Rmax and thickness Hmin are also shown in the output boxes. For those who use reactive adhesives, you can choose a viscosity μmax at tmax with the simple assumption of exponential increase with time from the original value μ0.